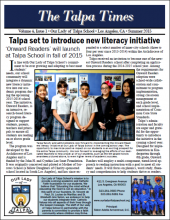 Check out the most recent issue of The Talpa Times, our school newsletter, to read about activities and events at Our Lady of Talpa School. If you would like more information about The Talpa Times, or if you or your business would like to help sponsor a future issue, please contact Our Lady of Talpa School’s Development Coordinator. We would greatly appreciate your support, and would be happy to include an advertisement, message or graphic from your company in our newsletter.